Earlier today, former Congressional candidate Tim Canova announced that his legal team filed a complaint officially contesting the results of last month's congressional race, in which Canova faced off against former DNC Chairwoman, Debbie Wasserman-Schultz. "Unfortunately, this is only the most recent instance of what is now a pattern of misconduct by Snipes regarding paper ballots, as it follows barely a year after Snipes unlawfully destroyed hundreds of boxes of all paper ballots cast in Broward County in the 2016 Democratic primary for Florida’s 23rd Congressional district between Canova and Schultz, in violation of state and federal law and while Canova’s prior lawsuit to inspect those ballots was pending, as already determined on summary judgment by the Florida Circuit Court." "In addition to Snipes’ failure to safeguard the integrity of the paper ballots in the 2018 general election for FL-23, the certification of the purported results is based on inadequate and incomplete information, and it is therefore an invalid certification of those results. More specifically, approximately 98,000 votes are reported by Snipes to have been cast for Schultz without any indication as to how and when those votes were cast. To date, Snipes still has not provided this information about the “98,000 votes from nowhere.” These votes alone are enough to change the results of this election, or at the very least to place in doubt these results." This latest news comes under 24 hours after the Sun Sentinal reported that Florida's Governor Rick Scott had fired Brenda Snipes, effective immediately. The report states: "Florida Gov. Rick Scott suspended Broward County elections supervisor Brenda Snipes on Friday and installed a close ally to lead an office that could play a pivotal role in the next presidential election. Peter Antonacci, president and CEO of the state’s business-recruitment agency Enterprise Florida, will serve for the remainder of Snipes’ term until a replacement can be chosen by voters in November 2020, the governor’s office announced." Disobedient Media previously covered the disastrous aftermath of last month's midterm elections, specifically concerning the race between Canova and Wasserman-Schultz. On election night, the official vote count awarded a mere 5% of votes to Canova, despite a previous poll revealing the independent was tied with the former DNC Chairwoman. This glaring discrepancy prompted vocal calls for the invalidation of the race. Given Snipes’s history of illegal ballot destruction which benefitted Wasserman-Schultz's interest, as well as the fact that Snipes was photographed campaigning with Wasserman-Schultz days before voters went to the polls, it would be ludicrous if Canova and the public failed to question the validity of the results. In a previous appraisal of Debbie Wasserman-Schultz's career, Disobedient Media noted her central role in seeing Bernie Sanders cheated out of the Democratic Party nomination in 2016, as well as her probable involvement in bizarre event surrounding the DNC Fraud lawsuit (voice-modulated phone calls including the phrase “okey-dokey” ), and the grossly underreported Awan scandal. Disobedient Media additionally noted the furor that erupted after the publication of video evidence of a digital scanner voting machine sending results wirelessly. Some have also accused Snipes and her affiliates of falsifying ballots ‘as needed,’ dubbing the practice the ‘Brenda Snipes Process,’ which was allegedly used routinely in order to ensure a desired election outcome. 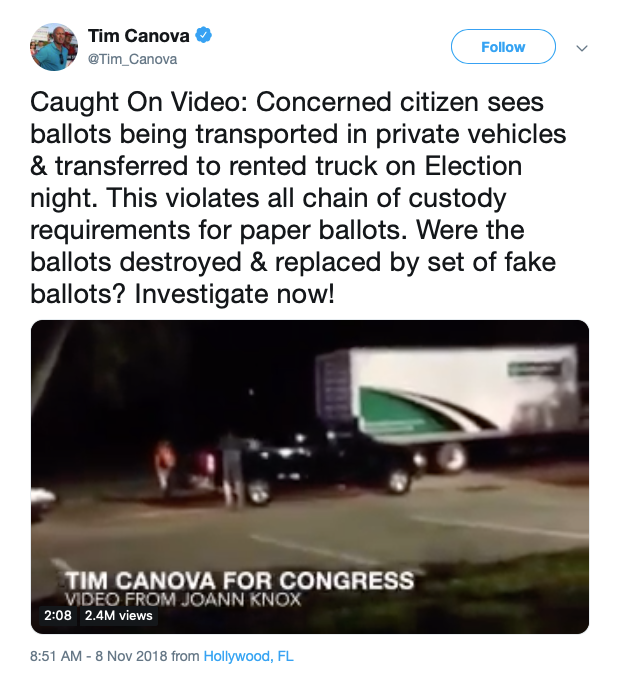 Independent journalist and progressive activist Niko House also set the internet on fire when he published a video of purported ballots being illegally and improperly transported. House discussed what he witnessed in Florida on election day with Lee Camp on RT's Redacted Tonight. Tim Canova has also called for the resignation of Snipes’s Director, Dozel Spencer. As noted by this author and others, Brenda Snipes is merely the public face of a deeply corrupt political system, and without a massive overhaul, business will most likely continue as usual in Southern Florida - at the expense of its constituents. Prosecution of those involved in documented, home-grown election interference is also essential moving forward. However, one should be under no illusion that such measures are likely in the near term without massive public pressure. Regardless, the significance of Canova's two races against Wasserman-Schultz, as well as his campaign's quest for transparency, should not be forgotten. He is one of the very few progressive candidates who has opted to fight corruption head-on, from outside the DNC, rather than concede and meekly endorse the perpetrators of it from within the Democratic Party. Unlike the faux "#Resistance" against fictional Russian-collusion or Russian-hacking, Canova is the singular example of real resistance against actual US election rigging in one of the most corrupt political fiefdoms in the country. It is for all of these reasons, many believe, that the discrepancy between polling and election results was so extreme in Canova's latest race. It wasn't about "safely" beating Canova, it was about making an example of him to such an extent that no one else would follow in his footsteps. With all of this in mind, it is critical that the public support Tim Canova's efforts in contesting last month's election results. Donations can be made via the Canova campaign website. Disobedient Media will continue to report on the corrupt dealings surrounding Debbie Wasserman-Schultz, as well as the efforts of Tim Canova and his campaign.